Mary, Queen of Scots lived for 44 years, 13 of which were spent in France, 19 in England, and just 12 in Scotland. In fact, Mary spent more years as a prisoner in Sheffield Castle than she did living in her native land. Mary spent two spells in Scotland. 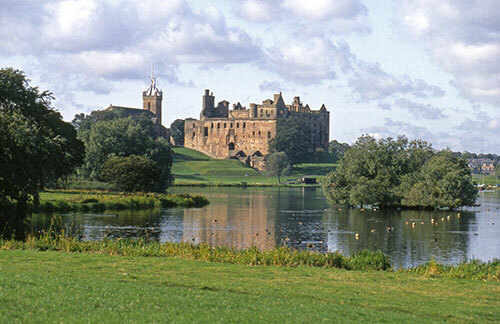 For her first five years, she enjoyed the surroundings of just four residences – Linlithgow Palace, where she was born on 8 December 1542; Stirling Castle, where she was crowned queen on 9 September 1543; Inchmahome Priory, where she lived for three weeks following the defeat of her army at the Battle of Pinkie on 10 September 1547; and Dumbarton Castle, to which she was taken for her better safety on 22 February 1548 and where, five months later, she was betrothed to four-year-old François, the French dauphin. It was from Dumbarton that Mary set sail for France. Linlithgow Palace, birthplace of Mary, Queen of Scots. It was a very different story following Mary’s return to the land of her birth, on 19 August 1561, to begin her personal reign as Queen of Scots, for it seems she was forever travelling around her realm. By now aged 18 and already a widow, Mary chose to take up residence at the Palace of Holyroodhouse in Edinburgh. Mary soon realised that, in order to win the hearts of her subjects, she would need to travel among them – no television or Twitter in those days. So, barely had she settled in at Holyrood than she was on the move, on the first of numerous ‘royal progresses’ that would take her to all four corners of her realm – almost, as she got no further than Dingwall in the north and Inveraray in the west. From Glenluce Abbey, in deepest Galloway, to Arbroath Abbey by the North Sea, and from Hermitage Castle, hard by the English border, to Spynie Palace, in distant Moray, Queen Mary rode about the country, meeting and greeting her people and undertaking official duties, as well as holidaying away from prying eyes – much as our present queen does. Sometimes she would be on the road for months. By this author’s estimates, she may have covered some 4,000 miles in her six-year reign. Mary stayed in many other places around her realm too, mostly the stately residences of her leading nobles and clergy. 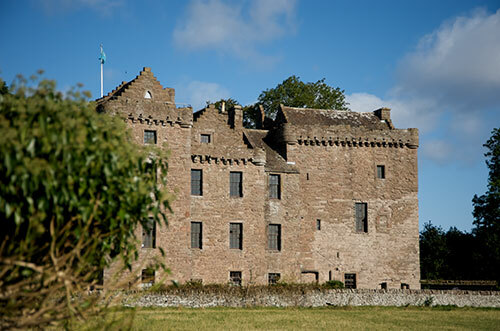 Many of these are now in the care of Historic Scotland, including the castles of Balvenie, Cadzow, Castle Campbell, Craignethan, Crichton, Edzell, Hailes, Hermitage, Huntingtower (then known as The House of Ruthven), Lochleven, Lochmaben, St Andrews, Spynie and Tantallon, and the monasteries of Arbroath, Dundrennan, Glenluce and Whithorn. Huntingtower, known in Mary’s time as the House of Ruthven. Keeping Queen Mary on the move as she progressed around her realm was a colossal undertaking. She didn’t just travel with her ‘four Marys’ – the Ladies Beaton, Fleming, Seton and Livingston – but took most of her personal household of over 200 servants, and a vast amount of luggage. She normally travelled on horseback for, as her contemporary Sir Thomas Eliot observed, ‘To ride surely and clearly on a great horse undoubtedly importeth a majesty and dread to inferior persons’. Only when pregnant did she agree to be carried on a litter. Accompanying her by horse were her Master of the Royal Household, Lord Seton, her 16 femmes de chambre (personal maids) and her bodyguard. The remaining household and all the luggage went by cart and, if travelling any distance or for a lengthy period, that baggage train would have been huge. Mary also travelled with her dressmaker, furrier, shoemaker, perfumier, apothecary, master cook, jester and others, as well as all the accoutrements she couldn’t possibly live without – her 62 dresses, a jewellery collection that was the envy of western Europe, a library of more than 300 books, her beloved musical instruments, sports gear and so forth. Then there were the tapestries, bedhangings, favourite items of furniture – an endless list. Just imagine the chaos when Mary and her train arrived at their destination. Pity, for example, the poor Earl and Countess of Argyll at Castle Campbell in January 1563, having to vacate their own apartments in the south range to make room for her majesty and her immediate household, and the ensuing disruption as everyone else in the Argylls’ household ‘moved over’ to make room for their lord and lady in turn. And all those chests containing Mary’s ‘essentials’ being carried in, while her French master chef did his best to convey the queen’s dietary requirements. All this for a two-night stay. 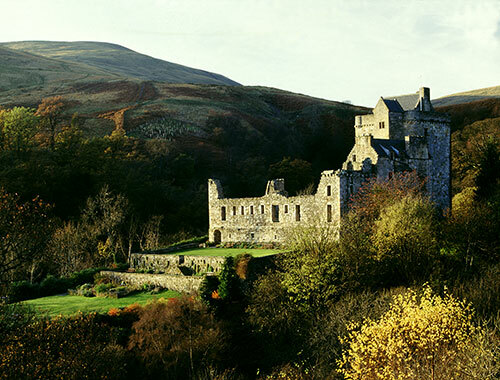 At Castle Campbell, the Earl and Countess of Argyll had to vacate their apartments for Mary. Fortunately, the whole operation didn’t cost the poor Scots anything, for Mary paid for everything from her French dowager income of £30,000 per year – the equivalent of several million pounds today. 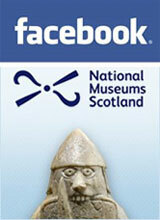 Find out more about Mary, Queen of Scots here. This blog post has been adapted from a longer article originally published in the Historic Scotland magazine, available to Historic Scotland members.